Occasionally the question comes into Criticwatch asking why we are so obsessed with quote whores? Which is kind of like asking why a golfer is so obsessed with driving the ball or a pitcher with throwing strikes? What we do is not an obsession. We see it as a combination of having a little fun at the expense of some bottom-feeding "critics" and showing you how far they will sink to see their names in ink. Especially since 90% of them don't actually write anything. Has that sunk in yet? The ones we should be asking that question of is Warner Bros. No, they are not exclusive when it comes to seeking out or fashioning easy soundbites for their junket junkies, but they are really pouring it on so far in 2011. January and February is the breeding ground for the junket whores. They swarm on the studio dumping ground before they can unleash their big seasonal releases and offer support where they are normally in the vast minority. We are eight weeks into the year and the only wide release with a "fresh" tomato (60% critical approval or more) is the Justin Bieber film. What does that tell you? Other than perhaps all critics are fucked in the head? It's that the movies are not very good. We are all prone to disagreements, of course. I have given favorable reviews to No Strings Attached (50%), The Mechanic (48%) and The Dilemma (25%). So if you disagree and want to question my critical faculties, go right ahead. But expect a debate rooted in more than just adjectives. 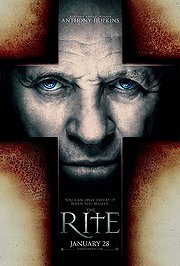 Go back to the end of January with WB/New Line's release of The Rite, a film that 4-out-of-5 critics at Rotten Tomatoes gave a negative review to. Instead of pooling the 20% in favor of the film, the studio found these people to sum it up in just one word. Excuse me, Miss Simonian, do we need to remind you that since his Oscar-winning role in The Silence of the Lambs, Mr. Hopkins has been nominated three more times for performances in The Remains of the Day, Nixon and Amistad. Not to mention work in Howard's End and Shadowlands. But you are saying that The Rite is his best performance since Lambs? Can we get a whore out there to attach their name to the word "moronic?" Do we need to create a law that a certain number of film experts need to declare a film a "masterpiece" before the term can officially be used by anyone? Or maybe we can at least have a forum on what constitutes "an instant classic" so Carrie Keagan can attend. Now, the second best reviewed wide release of 2011 is Warner Bros.' Unknown, which basically amounts to 56% of RT's critics forgiving the final act and 44% being unable to. And we have our first chance to enact the brand new TraversWatch for 2011. It is his third quote of the year, so Warner Bros. joins IFC and Fox Searchlight in this early exclusive company. And we hope it stays that way. You see, the goal of TraversWatch is to see that the studios do themselves a favor in reducing the number of times they use this hyperbolic quote machine from the previous year. We know it is unreasonable to expect him to disappear as a whole in just a year, so we are instituting the baby steps plan. In 2010 Warner Bros. used his praise on six films (The Book of Eli, Splice, Inception, The Town, Hereafter, Due Date), an admittedly small amount considering he hit a personal best 81 quotes last year. So their goal is to use him on no more than five films in 2011. Choose them wisely, WB. You don't need him on widely praised efforts like Inception and The Town. Use him on your Due Dates and your Rites. But you only get five. See, WB? Travers does not respect you or your efforts. He just recycled the exact same words he used for Sony Classics' Moon in 2008. Provided, of course, that someone there didn't write it for him. Let's move on to your other choices for the Unknown ads. With Unknown being only second to the Bieber film in its critical score, we will give a momentary pass to Shawn Edwards and Bill Bregoli. Though Bill, when isn't Liam Neeson intense? Ah, there's Carrie Keagan again. This time taking a page out of the Jill Simonian playbook and, in five words, trying to tell us that Neeson is better in Unknown than he was in Schindler's List, Kinsey or even Taken. Yeah, I get it, Jeff Craig, you think the film "tops Taken in every way," but that's only because you thought the film was about you, you faceless, press release reader. 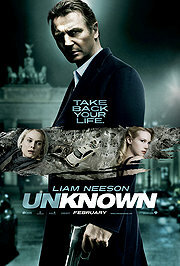 But Stuart Lee, do you really want to make the argument that Unknown is "the best action thriller in years?" I guess it is all relative to how many years you are talking about. For the sake of argument, we'll reduce it to the lowest possible plural which would take us back to 2009. And if we must excise Taken from that equation, I suppose it all depends on what you constitute as an "action thriller" Do Inception and District 9 not qualify because of their sci-fi roots? What about The Town? Too much talking in-between the robbery scenes? Does The Hurt Locker not fit into your definition? If so, then you can duke it out with Pete Hammond who said that The A-Team was "the best action film in years!" It will be the greatest debate since Carrie Keagan and Rick Warner from Bloomberg News fought it out for the right to use this quote. Clearly it was a draw since Keegan's words were used on the commercials and Warner's quote was printed in the newspaper ads. That's what you get studios when you use people with a particular set of skills. Namely taking what you give them. Please, tell us we're wrong. It only makes them look worse. And so we come to this week's offering from Warner Bros., the Farrelly Brothers' Hall Pass, which if you are keeping track ranks somewhere between The Eagle (36%) and I Am Number Four (30%) on this year's quality scale. But it is right up there with Unknown on the amount of untrustworthy people pimping it as this week's big thing. Those are the quotes the commercials have been using for the film about two married guys not getting any at home who get a week off from marriage from their significant others. Shawn Edwards called it "outrageous" and "unpredictable." Two other films he has referred to as "outrageously funny" in the past were Waiting and I Think I Love My Wife. How's that for a coincidence? Less so is the continuation of the quotes seen the newspapers today. Speaking of which, when did Carrie Keagan get so effing popular? Her Freshman year at Criticwatch in 2008 she managed to hit the #9 slot on the whores of the year, but has only registered a pair of quotes per year since. From Jan. 28 to Feb. 25 of 2011, she has already matched her entire output from 2009-10. And more than half of her quotes since '08 have been for the WB, including such gems as Speed Racer and 10,000 B.C. Funniest film of the year, Carrie? OK, how many comedies are you counting in 2011 so far? Assuming we're not including The Roommate (6%) or Season of the Witch (4%), I am counting a grand total of seven. And that generously labels Just Go With It (19%) and Big Mommas: Like Father, Like Son (8%) as comedies. Funnier than Cedar Rapids or No Strings Attached, Carrie? Care to debate? Or are moviegoers not interested in hearing from someone who said 27 Dresses gave us "27 more reasons to love Katherine Heigl?" In March, Warner Bros. will be releasing Red Riding Hood and Sucker Punch. It will be tempting for them to put things in the ads from Mark S. Allen saying "it outdoes Twilight in every way" or that "Zack Snyder has done it again." But along with keeping the Travers output to a minimum, we're challenging the studio to actually invite some real critics to early screenings. Earlier than the junkets. Get a taste for what the other half might actually say in your favor. You only need four or five quotes, if even that, for your ads and you will save yourself the trouble (not to mention cash) in flying and dining all the usual suspects of whoredom.